In spite of his oversize nose, knobby knees and sprawling crown of antlers, the moose still manages to look majestic as he lumbers across subarctic terrain. 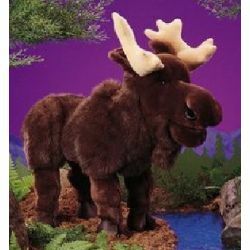 This Moose puppet with his soft plush fur and serious expression, promises to be the perfect answer to a little northern exposure. Hand enters underneath. Moveable mouth.